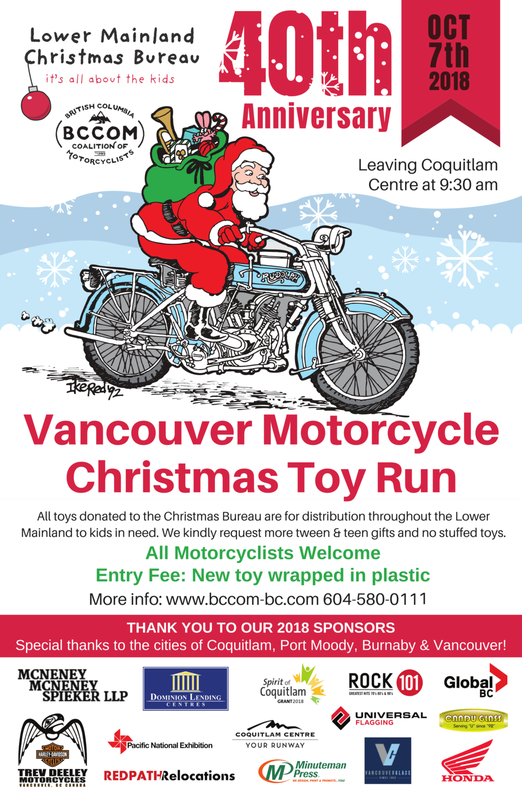 Announcing the 40th Anniversary of the Vancouver Motorcycle Christmas Toy Run — . Join us for the 40th Annual Vancouver Motorcycle Christmas Toy Run, on October 7th, 2018, to fundraise for toys to give to kids in need. Entree fee for the Toy Run is a new toy wrapped in plastic. We encourage you to bring toys for kids from 0-18 years of age to donate and no stuffed toys, please. Help us spread the word and share the event on Facebook. If you are interested in volunteering at our event please contact info@lmcb.ca.